This stately, iconic view home sits prominently on a tree-lined block in Pacific Heights. An impressive facade and formal entry welcome you into this refined home of generously-sized and gracefully-proportioned rooms including a beautiful living room, formal dining room, a chef’s kitchen, a breakfast room, three bedrooms, three full and two half baths, an au pair suite and a serene garden. The pent-level’s family room and expansive, protected roof deck offer awe-inspiring views. Details include high ceilings, handsome moldings, regal iron work and abundant natural light. This meticulously cared for home offers exceptional outdoor-living combined with elegant interior spaces all within a block of Fillmore Street. This beautiful, fully-detached house enjoys a grand living space and the comforts of modern living with its tastefully remodeled kitchen and bathrooms. The home features large formal living and dining rooms, as well as a powder room and gourmet kitchen that opens directly to the backyard, perfect for entertaining, while enjoying a Viking range and Bosch dishwasher. A great floor plan awaits you with 3 beds / 2 baths up, and downstairs with either a 4th bedroom & full bath, or a media / family room. Located just steps from Laurel Village, this house enjoys numerous shops and restaurants nearby. A large, scenic backyard, separate laundry room, and garage with internal access complete this amazing house. Don’t Miss! This grand Pacific Heights Victorian home has been remodeled and updated while still retaining its old world charm. Fully detached, it is flush with sunlight on three sides. Gorgeous period detailing throughout – soaring 13′ ceilings, stunning hardwood floors, ornate mouldings – and open floor plan kitchen/dining area with high-end chef’s kitchen. Four bedrooms and two full bathrooms on one floor! Two additional spacious levels of bonus rooms. Detached rentable cottage with studio apartment and separate entertainment room. Large landscaped courtyard and deck for entertaining and play, 4 car parking. Walking distance to top schools, parks, public transportation, shops & restaurants. Walkscore 97-Walkers Paradise! 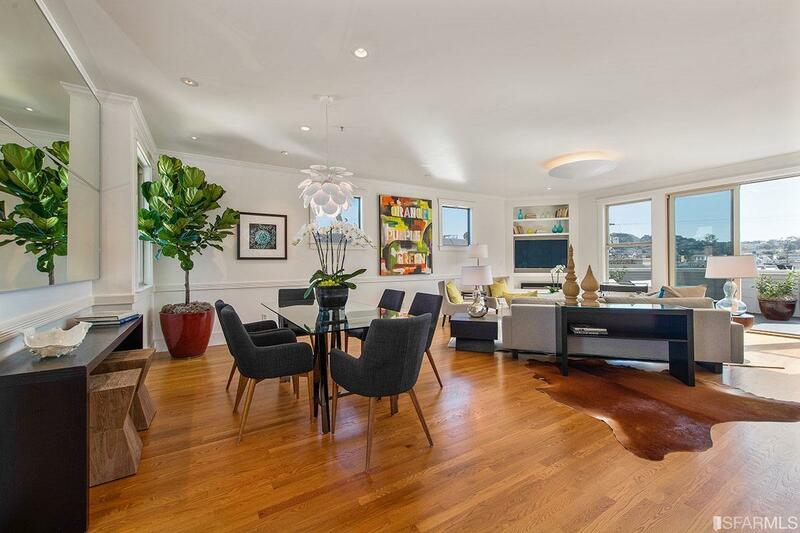 2925 Larkin Street represents a rare opportunity to acquire a newly remodeled 4 bed / 3.5 bath semi-detached house with views in Russian Hill. The main level is perfect for entertaining with the gourmet kitchen, featuring Thermador appliances and soapstone countertops, opening nicely to the dining area. The spacious living room enjoys huge bay windows with an abundance of natural light flowing in. Walk downstairs to enjoy the family / media room with adjacent wine cellar. The upper level features a view penthouse room, great for a home office with easy access to the huge roof deck with water views of the San Francisco Bay and Alcatraz. A garage with interior access and incredible Walkscore of 95 complete this fantastic house. Exquisitely remodeled for today’s lifestyle, this elegant home combines gracious rooms, abundant light from expansive windows, 2 fireplaces, soaring ceilings & beautiful details with chic, modern upgrades including a chef’s kitchen, family room, luxurious master suite with sublime, spa bath, wine room, elevator, 4-car garage and south-facing deck with city views. The garden level’s legal unit offers wonderful possibilities as a media room, home office, guest quarters or a rental unit with its own separate entrance. Walk to the boutiques and caf on Sacramento Street & in Laurel Village. Exercise enthusiasts will love the close proximity to The Presidio National Park’s trails, fields, golf course and tennis courts and the JCC. Prominently perched in San Francisco’s magical Corona Heights neighborhood, this duplex showcases sweeping views framed by banks of picture windows from all three light-filled levels of living. The impressive street presence hints at what is inside: gracious open spaces, ideal for entertaining, with an indoor-outdoor flow provided by sunny, walk-out view decks with each unit. The lower unit offers two levels with 3 bedrooms and 2.5 baths, and includes an additional bonus level with separate street access. The upper flat has 2 bedrooms and 2 full baths. This meticulously maintained freestanding property offers flexibility for those who wish to partner, those seeking income, or those looking for a lovely view property in a fantastic location. Huge top-floor 2-level condo offers elegant finishes & grand scale with the feel of a single-family home. Top level comprises an amazing open entertaining space with windows on all sides. Gorgeous kitchen features new quartz counters, 6-burner Viking range and an island for informal dining, plus an adjacent family space. The enormous dining and living areas are a dream, with direct access to two large, private decks! Lower level offers three REAL bedrooms, a big bath w/separate shower and tub, plus an ENORMOUS master suite w/ FP, custom walk-in closets and luxe bath w/dual sinks! In-unit laundry, one-car parking and storage. Big organized closets throughout. Fantastic condition and incredible location close to dining, shops, transit.